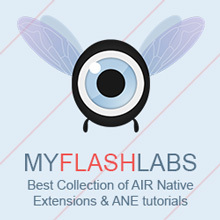 AIR Maps ANE provides the support for using the native mapping component in your Adobe AIR application. It uses Native Extensions to access the maps APIs for that platform and provides an AS3 interface so that it can be used in Flash Mobile applications developed using Adobe AIR. drawViewPortToBitmapData : It allows you to get the mapview which is displayed on a separate plane above flash stage in form of bitmap data. PIN_SELECTED and PIN_DESELECTED Events : Dispatched if a marker is selected or deselected resp. MapEvent.DETAIL_BUTTON_PRESSED : Dispatched when details button is pressed for a marker. Map.openMarker(markerID) : Open the marker callout for the marker with marker id provided as argument. Closes any already open marker. Map.closeMarker() : Closes the open marker. //Changes the center location of the map to the given location. //Since the mapview is displayed on top of the Flash stage just like stagewebview, inorder to display flash components above stage, call this function to get the viewport on a bitmap data.